A Huntington Beach fire damage can be disastrous. West Coast Restoration Inc's damage restoration and fire repair service can seamlessly bring your Huntington Beach smoke damaged or fire damaged home out of the ruins and back to its original condition. West Coast Restoration Inc has been providing Huntington Beach fire remediation since 1990. Our Huntington Beach fire restoration includes a thorough assessment of the damage, a fair and reasonable plan of attack and a skilled crew that is up the challenge. West Coast Restoration Inc performs smoke damage cleaning, soot damage cleaning, and the safe removal of toxic chemicals for Huntington Beach CA fire damaged homes. Our Huntington Beach fire restorers will also eradicate the smoke smell and neutralizes odors. Huntington Beach homeowners know that they can trust West Coast Restoration Inc's compassionate Huntington Beach fire restoration team to remediate and restore their Huntington Beach fire damaged property with the highest standards of quality and safety. For professional restoration service in Huntington Beach CA, call West Coast Restoration Inc at (714) 584-4894 and we will take immediate action on your fire damage restoration. Huntington Beach fire damage victims can count on West Coast Restoration Inc! 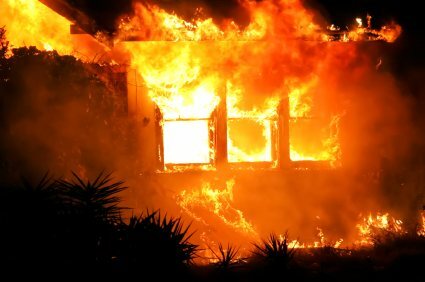 Talk with a Huntington Beach Fire Damage Expert now! Did you know you should have your Huntington Beach fire sprinkler system fully inspected at least four times each year? Installing a sprinkler system won’t prevent a fire from occurring, but ensuring they are properly maintained and fully functional should a fire in Huntington Beach occur is imperative to you, your environment and family. Fire sprinkler systems in Huntington Beach, whether in your home or commercial building, are prone to microbial corrosion and rust, resulting in pinhole-size leaks, the pipe walls to thin and sometimes even the sprinkler system to fail. In order to ensure your sprinkler system is functioning as it should be, inspection and maintenance are required on a frequent basis. West Coast Restoration Inc offers immediate service to evaluate and estimate your fire damage. Huntington Beach homes which have suffered a fire, whether small or large, may be contaminated. Smoke residues combined with moisture create acids which can result in irreversible damage if not addressed promptly. West Coast Restoration Inc fire restorers in Huntington Beach California work diligently to remove the hazardous contents and neutralize odors with techniques they have mastered for 29 years in home restoration. Huntington Beach homeowners are assured that their fire-damaged Huntington Beach home will be safely restored to its original condition with West Coast Restoration Inc's effective fire repair. Huntington Beach houses which we remediate will also have any damaged floors, walls, ceilings, mouldings, windows, door, and roofing repaired or replaced and painted to their pre-fire condition. Don't wait for Huntington Beach fire damage repair, call West Coast Restoration Inc at (714) 584-4894 for full-service fire restoration in Huntington Beach CA today!